Each week, until December, we're releasing a short film in which we take a closer look at several Italian regions. Some you may know, others not as much, but we see them through the eyes of the people who are making the wines there. In our latest adventure we visit the new headquarters for the Marchesi Antinori family, in Chianti Classico, Tuscany. 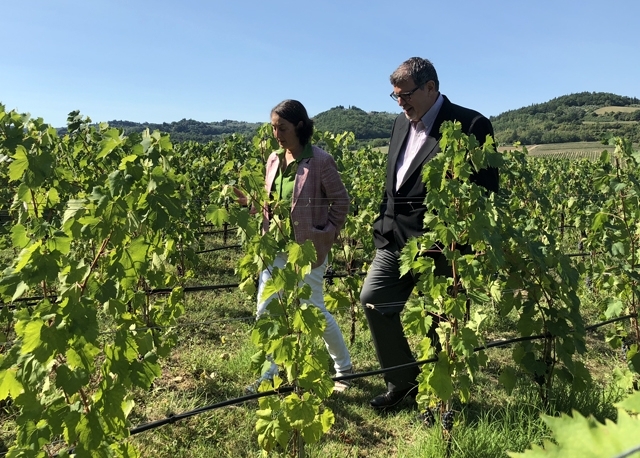 We spent a marvellous morning with Albiera Antinori, a member of the 26th generation of the Antinori family, who is now leading the charge towards seven centuries in the wine business. Albiera Antinori is the president of Marchesi Antinori with the continuous close support of her two sisters, Allegra and Alessia, each actively involved in the business. Like her father, the Marchese Piero Antinori, the women have paid homage to the traditions of their homeland while continuing to explore all that is possible in the modern wine world. The Marchese Antinori, is the current Honorary President of the company, but make no mistake, change is in the wind as exemplified by our tour of the spectacular new Antinori nel Chianti Classico facility in Bargino, about a forty minute drive south of Florence. It’s been over 100 years since the entire company has come together under one roof and as the Marchese remarked, it’s going to be special for all the employees to experience the smells and the air of excitement that surrounds the harvest every year. Please join us on our latest leg of our Italian adventure, as we explore the commitment of the Antinori family to the noble sangiovese grape and the renaissance of Chianti Classico. To watch all of our Italian adventures click here.